Thought begins in disagreement, the terms of which demand to be articulated. Robert Hass’s A Little Book on Form: An Exploration into the Formal Imagination of Poetry in fact is a book about the importance of the poetic turn. Though odd, often careless and confounding, it is clearly a book (like some others, including Helen Vendler’s Poems, Poets, Poetry) that acknowledges the primacy of structure (understood as the pattern of a poem’s turning) over form. In the book’s opening sentences Hass indicates his approach. His book will not be like typical books on form, which take “form to mean traditional rules previous to composition—rules for the formation of the sonnet, for example, or the villanelle” (1). While “useful,” such information “didn’t seem [to Hass] to have much to do with the way the formal imagination actually operates in poetry. It does not, for starters, address the formal principles, or impulses, that underlie the great majority of poetry in English and American literatures not written in these conventional forms” (1). One meaning of form that has currency has the meaning “traditional form,” which usually means the use of rhyme and meter. This virtually mystical fifth option, though, remains merely suggestive—it in fact will go essentially unexplored by Hass. Hass actually largely conceives of form in the terms he presents in his fourth bullet point. He’s interested in basic elements, “the essential expressive gestures…inside forms” (2). And these gestures are best described as structures. Again and again, Hass will actively set aside issues of rhyme, meter, and external shape in order take apart poems to reveal the arrangements of and the relationships among their basic parts, their structural components, separated (and joined) by turns. Hass qualifies this statement a bit, noting that there are “descriptive” sonnets that “have no turn at all” (186). However, while Hass is correct, this in no way compromises the central place of the volta in terms of the significance of the sonnet (in the sonnet, the lack of a volta is significant), for Hass, this is a minor note: in Hass’s extensive discussion of the sonnet (pp. 121-186), which involves numerous references to the turn, he devotes a single sentence to the fact that there exist sonnets without turns. The turn also is what gives power to two-line forms. Hass states, “[T]he two-line poem is based on a human pattern of exchange: question-and-answer, call-and-response. This was one of the basic forms of West African folk culture and both the work song and the spiritual evolved from it” (28). The two-line poems Hass provides follow this structure, turning from question to answer, from call to response by which, as with Bantu combinations, in which “[t]he first singer produces an image; the second supplies another,” a non-narrative, riddle-like “internal comparison” is created (29). (For further examples of the question-and-answer structure, click here. For further thinking on two-line poems, click here.) Hass points out that “[t]his is basically the principle upon which many haiku [though typically three-lined] are based…[a]nd it is…the basis of the couplets in the Persian ghazal” (28). In fact, when discussing the ghazal and its couplets, Hass quickly dismisses the importance of meter, stating, “The ghazal was intricately metrical in ways that we don’t need to go into” (a remarkable claim in a book about form! ), and he turns to discuss internal structure: “In practice, though the couplets are discrete, they are linked by theme, and the subtlest of them proceed almost like a set of Bantu combinations, linked line by line, couplet by couplet, through internal comparison” (42). Structure also is the defining characteristic of the Chinese quatrain called the chueh-chu. According to Hass, “The Chinese quatrain was one of the great literary forms of the Tang dynasty. It was called the chueh-chu, or ‘curtailed verse.’ It was a form of ‘regulated verse,’ or chin-t’i-shih, in which the pattern of tones followed certain rules” (103). Hass continues, citing Arthur Cooper: “‘…the fourfold structure [of this particular quatrain] has something at once like a little sonata-form and like the composition of a painting. The sonata form of these poems is reflected in the Chinese names of each of the lines: the first is called “Raising,” that is, the introduction of the theme; the second is called “Forwarding,” that is, development; the third, “Twisting,” or introduction of a new theme,[sic]; and the fourth “Concluding”’” (103). My rain-soaked herbs: some still sparse, some lush. They freshen the porch and pavilion with their color. These waste mountains are full of them. But what’s what? 1. So that’s it for poetic forms. Four hundred and fifty years of the sonnet, occasional sestinas and villanelles, the rarer occasional pantoum. One could add the ballad—short narrative poems, traditionally in four-line stanzas. And a couple more recent English language adaptation [sic]—the ghazal (see Chapter 2) from Persian and Arabic, the blues from the American vernacular. After one is done reeling from the fact that it’s a book on form that has the sentence “So that’s it for poetic forms” in it, one can then start to trace Hass’s particular interest: internal structure. Hass observes that “the impulse of prayer seems to be very near the origin of the lyric,” and prayer, he notes, has “[a] transparent structure. Praise, then ask” (202). Toward the end of this brief transitional section, Hass states, “Thinking about lyric, about the formal imagination working its way from the beginning of a poem to the end, one can turn to the work of genre, to the shapes of thought and arcs of feeling in the traditional kinds” (205). And this clearly is something other than form as traditionally conceived; Hass states, “So the rhythms of formal shaping in a poem are always working at at least a couple of levels—that of prosody, numbers falling through numbers to create the expressive effect of a piece, and that of—don’t know what to call it—thematic development, the way the poem makes its trajectory, creates its sense of movement (or doesn’t) from beginning to end, some of which is apt to get prompts from generic expectations, conscious or not” (205-206). Hass may not know what to call it, but we do: structure, understood as the pattern of a poem’s turns. Nowhere is this clearer than in Hass’s discussion of the ode, the first genre to which he turns. Hass emphasizes the ode’s traditional three-part structure: Pindar’s “strophe, antistrophe, and epode,” or, in Jonson’s version, “turn, counterturn, and stand” (210). And, in what we should recognize as a move typical of Hass, he plays down metrical form in the process. While “[t]he strophe and antistrophe had the same stanza pattern, and the epode a different one,” that doesn’t matter much because “[i]n translation the three-part metrical pattern isn’t evident”—“but,” Hass adds, “the basic formal pattern is” (210). For Hass, the ode’s “formal pattern” is its three-part structure: “The clue to the formal structure—what gets echoed in the history of the ode—is the way they begin in a place, and then take their audience on a journey—the entertaining stories in the middle part of the after-dinner speech [the typical occasion of original Pindaric odes]—and then come to their graceful conclusion” (211). In the section called “Reading the Ode” (223-291), Hass consistently breaks down the odes into their constitutive parts, parts separated by turns. Sometimes, there are three parts (231, 240, 250-252, 256), once five (242), and twice “several” (244, 278). For Hass, the turn is also at the heart of the genre of elegy. In the sections of his book that addresses elegy, Hass draws heavily on Peter Sacks’s The English Elegy. (Sacks happens to be one of the great thinkers about the poetic turn. To find a link to Sacks’s lecture on a type of turn he calls the “dolphin’s turn,” a lecture introduced by Robert Hass, and a reflection on that lecture, click here.) For Sacks, the turn is at the heart of the elegy: as Hass cites, “‘Daphne’s “turning” into a tree matches Apollo’s “turning” from the object of his love to a sign of her, the laurel bough. It is the substitutive turn or act of troping that any mourner—perhaps that language—must perform’” (296). As he attends to Milton’s “Lycidas,” Shelley’s “Adonais,” and Lowell’s “The Quaker Graveyard in Nantucket,” Hass notes that “[p]artly [he] will be tracking Peter Sacks’s reading of the poems in his The English Elegy,” but in doing so, “[w]e are tracking old, inherited formal structures for surviving and transforming the kinds of devastating loss that can sicken the roots of life” (303). The next nearly 20 pages track the sections and turns of these poems. After the sections on elegy, there’s some more to A Little Book on Form, including brief sections (about ten pages / section) on satire (325-334); georgic (335-343); variable stanzas and organic form (345-352); difficult forms (353-363); collage, abstraction, Oulipo, and procedural poetics (365-379); mixed forms (381-384); the prose poem (385-391); metrical stress (393-398); how to scan a poem (399-411); and how free verse works (413-429). However, as the brevity of these sections (and others: the section on blank verse is six pages long (115-120); the sestina and villanelle are given a total of nine pages (187-195); and the pantoum, slipped into the sestina and villanelle section, receives one page’s worth of attention) reveal: this is just clean up, just touching on some final topics, mere formalities. The real work of the book was already done, and that work was the work of troping our attention from metrical form to structural turning. While for me, and perhaps for many of the readers of this blog, it is incredibly interesting to witness how much the turn intrigues Hass, I want to be clear: I do not recommend this book. At all levels, it is considerably careless. Even if we allow, as Hass notes, that this book “began as a series of notes and reading lists for a seminar [he] was invited to teach at the University of Iowa Writers Workshop in the winter of 1995,” and so that the “[t]he notes are intended to be suggestive, not comprehensive” (1-2), it is still very problematic. It is poorly edited. Grammatical errors abound, and often partial and/or incorrect citations (David Mikics co-authored The Art of the Sonnet with Stephen Burt; Phillis Levin edited The Penguin Book of the Sonnet, not Phyllis) float about. Twice, M. H. Abrams great essay “Structure and Style in the Greater Romantic Lyric” is called “Style and Structure…” (214, 253). Hass states, “I’m very much aware that [my notes] come from what I happen to have read or be reading and that other readers will bring other lists and perhaps better example drawn from other traditions to the issues of craft discussed here” (2). But too many times A Little Book on Form reveals what feels like an almost active disengagement with its subjects. In a section called “Reading the Sonnet” (133-186) Hass offers a number of sonnets to be perused, but he does not make clear why he’s offered these and not others (including anything from Astrophil and Stella, a glaring omission near the core of a tradition with which Hass is familiar). A Little Book on Form also contains a number of claims that, seeing them in print, print being prepared to become a book, should have given anyone, let alone someone as smart as Robert Hass, some pause. For example, Hass writes, “People kept experimenting with the [sonnet] form though it is hard to name a decisive instance after Yeats’s ‘Leda and the Swan’ in 1923 and Frost’s ‘Design’ in 1936” (130). This is preposterous: see The Reality Street Book of Sonnets. Additionally, of the villanelle, Hass states, “It is a form that has produced at least four quite powerful poems”; they are, as Hass recalls them, E. A. Robinson’s “House on the Hill,” Dylan Thomas’s “Do Not Go Gentle into That Good Night,” Theodore Roethke’s “The Waking,” and Elizabeth Bishop’s “One Art” (194). Hass is right about these poems, but it is alarming that he won’t (or can’t) name another out of this tight, well-know group. (Surprisingly, Hass’s range of reference to contemporary poets and scholars seems to be severely limited. The avant-garde barely seems to exist in A Little Book on Form, and there are strong links only to work by folk from particular environs familiar to Hass: the Bay area and greater Harvard, with a tiny outpost in Iowa City). Replete with reading lists, Hass too-often relies on a reader’s willingness to do additional reading to collect insight rather than offer it himself. For example, Hass states, “The best way to get a sense of the four-line stanza in English is to pick up an anthology and read through it” (89). Such instruction is given or implied numerous times throughout the book. This level of disengagement is particularly disappointing when it comes to Hass’s unwillingness to enter into scholarly debate with other thinkers. When discussing the ghazal, Hass notes that “[b]y 2000 the Kashmiri-American poet Agha Shahid Ali had objected to these freehanded appropriations of the classic form and published, by way of protest, an anthology of poems, Ravishing Disunities: Real Ghazals in English, which follow the rhyme scheme and something like the meter of the classic Muslim form” (45). However, though he offers a smattering of examples of “real ghazals” (two couplets from three poems), Hass seems totally unconcerned about the issue of formal correctness—a shocking stance in a book (purportedly—though, as we now know, not really) about form. And nor does Hass engage Stephen Burt’s skepticism about the sestina. As Hass notes, in a 2012 essay called “Sestina! Or, The Fate of the Idea of Form,” Burt “reads the phenomenon [of “a recent explosion of sestinas”] as a product of the teaching of creative writing and as a symptom of ‘diminished hope for the art,’ a way ‘to emphasize technique, and to disavow at once tradition, organicism, and social and spiritual efficacy’” (193). Whoa. So, what does Hass think about this? We have no idea: we’re instructed to read Burt’s essay, and many of the sestinas he lists (Hass doesn’t make his own), and judge for ourselves (193). This disengagement reaches its apotheosis in the book when, in his brief discussion of satire Hass can’t even be bothered to consider its structural elements. Instead he states, “One would have to do more study of Horace and Juvenal and the Hebrew prophets than I’ve done to answer the question of whether there is a pattern of development, an inner logic to the shape of satire and prophecy like the ones one can make out in the ode and the elegy. It would seem that satire’s natural form would be the list, the bill of particulars” (328). And that’s that. But, of course, the real, deep disengagement results in nothing that is in the book but, rather, is a result of vital material having been left out. Hass seems to think that nothing of interest has been written about the poetic structure and its turn. But there has been a great deal of high-quality, insightful conversation about the turn. Jorie Graham has some very interesting takes on the turn. In fact, I was introduced to the turn by Graham in the fall of 1994, when I was just starting my studies as an MFA student in poetry at the University of Iowa–that is, the semester before Hass taught his first course on forms there. (A brief reflection on Graham’s thinking about the turn, and about what I learned about the turn, at Iowa can be found here.) And even if we focus solely on the sonnet’s volta, there are Paul Fussell, Christina Pugh, and—oh, yes—Dante. What is perhaps deeply disappointing for me about Hass’s book is that it makes it seem as though there is no conversation about the volta, or, more broadly, the turn. Therefore, Hass gets stuck. He doesn’t seem to have a language, or a way to think more deeply into poetry via the turn. His book suffers greatly because of it. If only A Little Book on Form had been restructured so that it started here, so that it could have ended someplace much more revealing and surprising. Preparing for the unexpected. You, poet, should be surprised by your own work. And you can work toward those surprises. What a treat, to find thinking about the turn making its way more generally into the teaching of poetry–terrific! In Denver on March 5? Want to learn more about and even try your hand at some poetic turns? Sign up for “Poetic Turns,” a day-long workshop led by Lynn Wagner. In this craft-centered class, we will explore ways to change direction using rhetorical moves and poetic structures. We’ll make lists with a twist, become ironic, switch it up halfway through and be concessional—not confessional. Inspired by Michael Theune’s Structure & Surprise: Engaging Poetic Turns, a book recommended by Kim Addonizio on her visit to Lighthouse, the craft shack is the perfect place to make and play—exercises, experiments, and mini workshops. Poets and prose writers both welcome. Get ready for a revolution. Lynn Wagner is the right person to lead such a workshop. She’s expert with the turn–just check out her poem “Black Dog / White Snow.” And then read more of her work on her website. As I argue here, there is a necessary difference between poetic form and poetic structure. Though I did not make this case in the linked-to essay, it also is the case that discussions of form often hide discussions of structure (by “structure,” I mean specifically the pattern of a poem’s turning). Something like this happens in Helen Vendler’s Poems, Poets, Poetry: An Introduction and Anthology, and I write about this here. A poem, like many a piece of expository prose, may open with a general statement, which it then illustrates and amplifies by particulars, as does Mrs. Browning’s sonnet beginning “I tell you, hopeless grief is passionless” (p. 185) (191). Or it might move from details to more general statement, as does Keats’s “Ode on a Grecian Urn” (p. 321), presenting details of the urn’s pattern and arriving at the conclusion, “Beauty is truth, truth beauty” (191). Asking “How do we look for structure?,” Kennedy suggests fourteen “methods of approach to a poem” to help one find a poem’s structure (192). While he notes that such work to newly approach a poem must also entail a return to and a more deeply informed rereading of the poem, Kennedy is clear about the kind of ingress structural awareness gives to understanding, stating that applying such knowledge to a poem “can be a means of entrance into the most difficult of poems, whether conventional in form or flexible, whether an epic or an epigram” (193). Of course, I admire greatly Kennedy’s work with structure, and his sense that structure is something significantly different from form. However, of course I also wish that Kennedy would have gone further and released structure’s turning from the discussion of form. I wish Kennedy might have gone so far as to give structure its own chapter, as it received in John Ciardi’s How Does a Poem Mean? (which I discuss here). Such focus is, alas, extremely rare, but it shouldn’t be: it’s simply a matter of being clear about what the vital elements of poetry in fact are, about what we really do, in fact, value in poems. Great turning certainly is one of those values. Though in my intro to poetry writing class I typically do not focus on the turn until the second half of the semester (there is so much to cover prior to this: creative process, artistic recklessness, the poetic leap, the many means to create surprise, etc), I recently have taken to providing students with an exercise focused on the turn in the first day of class. After performing the rituals of the beginning of the semester (taking roll, handing out and discussing the syllabus, etc), I introduce my students to the metaphor-to-meaning structure. We examine a couple of key examples (often Whitman’s clear “A noiseless, patient spider” and Rod Smith’s wild “Ted’s Head”)—I describe the metaphor-to-meaning structure, and I ask students to locate and explain the turn, which they can, and do. We then examine a handful of metaphor-to-meaning poems in which the turn reveals that the metaphor was meant to stand for or say something about poetry, or the poem, or that poet. Baudelaire’s “The Albatross” and Zbigniew Herbert’s “The Hen” work very well for this. We take some time, explore and appreciate these poems, and then I give my students their assignment: write a poem like these—write a poem that opens with a metaphor and closes by revealing that the metaphor (somehow) relates to poetry, poems, or the figure of the poet. The main bit of advice I give my students is to try to come up with a description of something very different from poetry to serve as the metaphor—much of the fun of reading a metaphor-to-meaning poem about poetry is the surprise that comes with finding out that, in fact, it is in some way about poetry. This, of course, seems like a lot to give students, especially on the first day. However, perhaps because it’s the beginning of the semester and everyone is excited to get underway, and/or because students want to begin to describe their orientation to poetry, and/or because, in fact, I keep this a low-stakes assignment (due the next class meeting, in which it is read but not workshopped—if students want to workshop it, they can later in the semester), and/or because no one has yet given such demanding assignments, my students typically have taken this assignment and run with it, and they’ve made some very nice poems as a result. Here are two student poems that ended up fitting the metaphor-to-meaning structure perfectly. Yet, even though these poems closely engage the structure, they do so in very different ways. With the metaphoric status of the blister(-as-poem) remaining a mystery until the end, Anjelica Rodriguez’s “Blister” makes a beautiful kind of surprising sense. However, the turn in Stephen Whitfield’s “Maturity” is more sudden, more shocking—it resonates with what Rachel Zucker calls the epiphanic structure. When there is only healing. I miss the urgency of my first poems. Some students used the metaphor-to-meaning structure as more of a launching pad. They ended up creating strong poems, but poems that, in the end, are not actually metaphor-to-meaning poems. Brittany Gonio’s “My Kind of Poetry” ended up as more of a cliché-and-critique poem. And I’m frankly not sure what to call Colleen O’Connor’s “Where We Sleep.” While it clearly is in dialogue with the metaphor-to-meaning structure, it is not, strictly speaking, a metaphor-to-meaning poem. But, of course, in the end this does not matter—what matters is that it, like the other poems gathered here, is a thrilling, engaging poem. on display in an upper class suburban home. have only a false appreciation. through my knuckles and veins. He never got to name. A different dog skitters on the wood floors. Who reminds him of his mother. And the new backyard feels too small. Soft as the belly of a sleeping bear. And the bed feels too big. A shape in the shadows. For how much they hold. If you like the poems you see here, I hope you’ll give this assignment a try. For a variant of this assignment, see “Extended Metaphor as Ars Poetica” in Tom C. Hunley’s The Poetry Gymnasium: 94 Proven Exercises to Shape Your Best Verse (30-33). In this assignment, Hunley suggests simply creating an extended metaphor (using anything that’s not poetry) and then calling the poem “Poetry” or “Ars Poetica.” A kind of meaning-to-metaphor poem, which can have great result, as well. My thanks to Anjelica, Stephen, Brittany, and Colleen for granting me permission to use their poems. “Raising the Net” appears in Spoon River Poetry Review 36.2 (Summer/Fall 2011). “Raising the Net” is a review-essay that uses Christina Pugh’s ideas about “sonnet thought” to consider the fate of the turn in some contemporary books of sonnets, including The Reality Street Book of Sonnets (a glorious mixed bag), Iteration Nets (in terms of turns: there are none), Nick Demske (interesting, and problematic), and Severance Songs (pretty great). 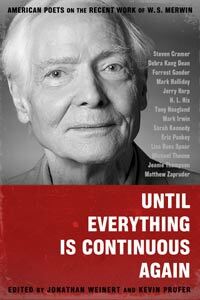 “The Shadow of Sirius: A Critical Conversation” appears in Until Everything Is Continuous Again: American Poets on the Recent Work of W. S. Merwin, edited by Jonathan Weinert and Kevin Prufer (Seattle, WA: WordFarm, 2012). “The Shadow of Sirius: A Critical Conversation” is an essay I co-authored with poet-critic Mark Halliday in which Mark and I debate the merit of Merwin’s latest book of poems–Mark: generally against; me, strongly for. As I prepared to write my portion of the essay, it became clear to me that Merwin was a great poet of the surprising turn. Though, of course, I make my case for this claim more fully in the published essay, a preview of my argument can be found here. 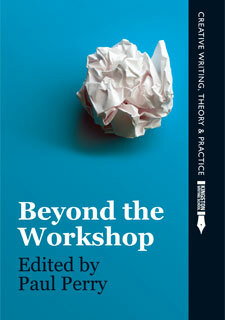 “Other Arrangements: The Vital Turn in Poetry Writing Pedagogy” appears in Beyond the Workshop. “Other Arrangements” is, in large part, a friendly amendment to Tom C. Hunley’s excellent Teaching Poetry Writing: A Five-Canon Approach. In his book, Hunley argues 1) that we need to get beyond the workshop as a core pedagogical method for teaching poetry writing, and 2) that one way to do this is to orient teaching toward the five canons of rhetoric: invention, arrangement, style, memory, and delivery. I contribute to Hunley’s argument by arguing that strong consideration of the turn should be a key part of the discussion of the second canon, arrangement. I wrote a little on this here, though, again, the published essay is much more complete. It feels good to get more thought about the vital turn out into the world. My thanks to my insightful and generous editors–Kirstin Hotelling Zona, Jonathan Weinert, Kevin Prufer, and Paul Perry–for allowing me the opportunity share my ideas, and for helping to make my writing and thinking on behalf of these ideas as strong as possible. Annie Finch’s A Poet’s Craft: A Comprehensive Guide to Making and Sharing Your Poetry is now out. It’s a big (almost 700-pages!) compendium that combines the genres of textbook, poetry guide, and guide to poetic forms. It’s totally worth getting because it contains so much: great discussion, exercises, and poems. It’s wide-ranging and insightful. I hope you’ll check out A Poet’s Craft. And I hope that anyone reading A Poet’s Craft will look further into the possibilities of poetic structure by reading Structure & Surprise. However, this blog also is a good place to start. Check out the structures covered in Structure & Surprise here. And check out nine additional structures here.